The Maori Language Act came into force, making te reo Māori an official language of New Zealand. Until the mid-19th century, te reo Māori was the predominant language spoken in Aotearoa/New Zealand. 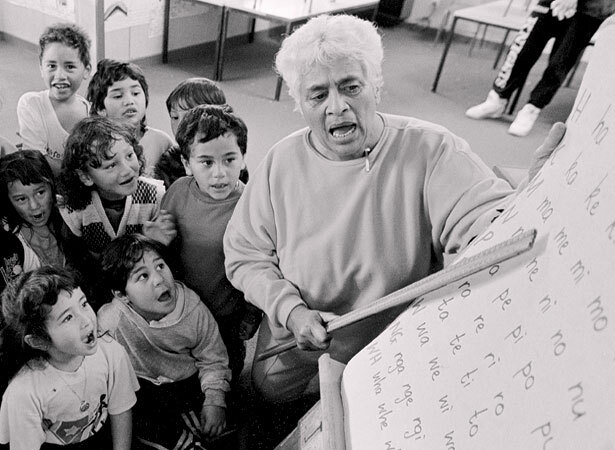 As more English speakers arrived, it was increasingly confined to Māori communities. By the mid-20th century, there were concerns that the language was dying out. In 1985 the Waitangi Tribunal heard the Te Reo Māori claim. This asserted that te reo was a taonga (treasure) that the government was obliged to protect under the Treaty of Waitangi. The Waitangi Tribunal found in favour of the claimants and recommended a number of legislative and policy remedies. One of these was the Maori Language Act, which made Māori an official language of New Zealand and established the Maori Language Commission, renamed Te Taura Whiri i te Reo Māori in 1991, to promote its use. In 2013 there were around 125,000 speakers of Māori in New Zealand – representing about 21 per cent of the Māori population and 3 per cent of all New Zealanders. We have 38 biographies, 1 article, 2 comments related to Te reo Māori recognised as official language . Why did it take so long for our people to finally get acknowledgement for a tikanga that was here far beyond the pakeha era. The English language has never been officially recognised under NZ law as being an official language of NZ. Only Maori and Sign language have been afforded this status. This anomaly needs to be rectified by the Government!